This week the Wolseley farmers market will be starting! Opening week will feature Rob Wadell playing from 4-6 Take a listen at http://robwaddell.com to hear what a treat you’re in for. Some other great musicians are on the horizon as well as a workshop with Getty Stewart from fruit share on fruit preserving and a workshop with the Domestic Divas on cultured foods. It was fortunate that the CSA pick up started a week early so we could work out the kinks of the new drop off before it gets busy with the market. 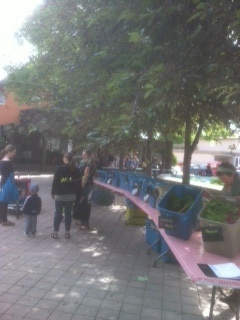 We have it set up so you can form a line on either side of the bins to collect you veggies. Please let us know what you think of the new pick up arrangement. This week Kitana is joining us on the farm and will be working for the rest of the summer. She started today and already put in a full day of hoeing. Besides that, not much happened but rain. We had spent somuch time last week cleaning picking through the hailed spinach and had a nice clean spinach patch for this week, and then it hailed again yesterday…so unfortunately the spinach will have some holes this week. Fortunately it will taste just as good. Thanks to Rebecca Hiebert for the recipes this week and for many more to come. Lettuce, spinach, pea shoots, arugula, mizuna, broccoli, pac choi, scallions, kohlrabi, turnip, radish, chard, kale, dil, cilantro and parsley. I harvested most of the broccoli on Sat as it was needing to be cut. It’s being refrigerated at 0 degrees so it should still be pretty fresh, but you may want to eat it first.